Waterfalls are beautiful places but they can also be dangerous! Every year accidents happen, because visitors neglect to take care about their safety. Most accidents happen because people are careless or because they want to show how strong and/or brave they are. Rocks near the waterfall can be slippery. It might be inviting to dive in the pool below, but there might be strong currents. You can cross the current to the other side, but can you also come back, when the water level has risen. Use your common sense and don't show off. 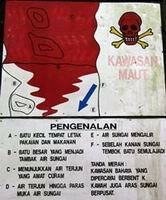 The signboard at the Chamang Fall in Pahang warns for dangerous currents, yet deadly accidents happen here almost yearly. Flash flooding can result from a downpour upstream. When this stream is temporarily blocked by logs for example, this flooding can occur amazingly fast. The signboard at the Chiling Falls in Selangor prohibits camping near the river, after people drowned there in flash flooding. Avoid the water when there is a thunderstorm. Even when the lightning strikes far upstream, surface currents can be dangerous.